Another difficult weekend for Molsom at Silverstone GP. Molsom went into Silverstone after a frustrating start to the season with a day testing the car prior to the races at the GP circuit in May. A busy test day changing the cars set up to improve the handling was constructive, with Molsom feeling more comfortable with the car, however still not keeping pace with the front runners. “Despite the positive changes we made to the car, I was still uncomfortable with the car on the entry into corners. The car felt a little unpredictable, and I was still struggling with the feel of the grip from the front axle.” commented Molsom. Qualifying saw Molsom out on his own mostly with very little slipstreaming possibilities. Slipstreaming is a huge part of the Silverstone GP circuit with the long straights and fast corners, a good tow around by another car is worth 1.5 to 2 seconds per lap. Molsom qualified 25th and 22nd on the road out of a large mixed grid of 52 cars for the 2 races. Molsom made a great start to the first race, where he had made up 4 places after the first few corners, but got pushed down the order later in the first lap, and spent the rest of the race trying to recover. Ultimately finishing 20th was disappointing. The second race was later that day, and Molsom started 22nd, in a much different race. Molsom could push harder with confidence and was fighting for position every lap of the 30 minute race, and finished in 15th place. Molsom missed the next round on Bank Holiday Monday at Castle Combe, but will be out again at Thruxton in July. 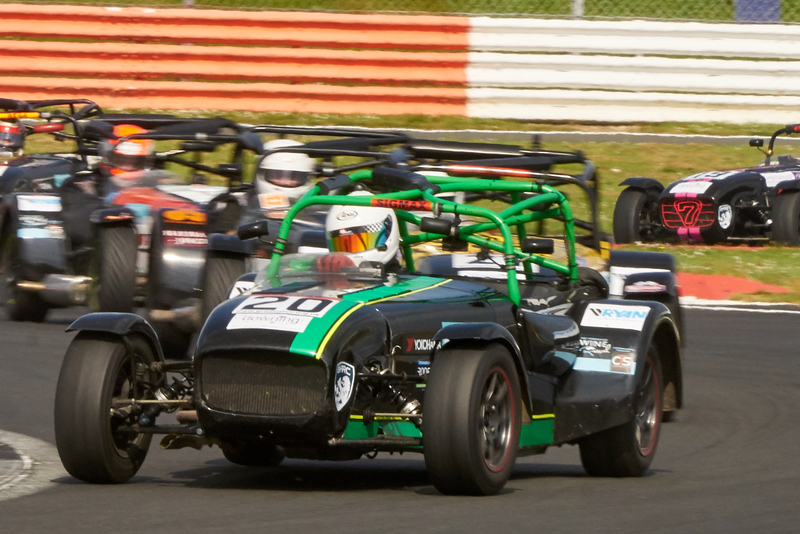 Molsom at Silverstone fighting for position in the second race.